The MS37B-25 is another addition to the Dino-Lite line of rigid tabletop stands. Similar in operation to the MS45BX-D2, the MS37B-25 offers a more economical platform for comparative analysis. It is designed for use with 2 microscope cameras and features 2 vertical poles and 2 focus blocks with dual holster assemblies which can be pivoted close together or farther apart, as needed. The key benefit of this arrangement is simultaneous side-by-side on-screen comparison of 2 individual specimens, or viewing 1 object from different angles. The ability to compare and contrast an unknown specimen against a known control makes this an ideal tool for law enforcement officials, forensics specialists, crime scene investigators and research scientists. The vertical post allows 360-degree rotational positioning of the observed specimen and up to 10 inches of working distance, which can be very useful when dealing with over-sized specimens or working with tools during observation. The dual holsters offer up to 45 degrees of viewing off the vertical axis, and most importantly, they each secure to a focus block with a fine-focus mechanism for precise vertical positioning. This in turn results in sharp, vividly-detailed on-screen images for capture and documentation. Precision machine-crafted components ensure a lifetime of performance in a well balanced and stable ergonomic design. Wt. 4.4 Lbs; Size 12.5" x 8.75" x 11.75". The MS37B-25 is another addition to the Dino-Lite line of rigid tabletop stands. Similar in operation to the MS45BX-D2, the MS37B-25 offers a more economical platform for comparative analysis. 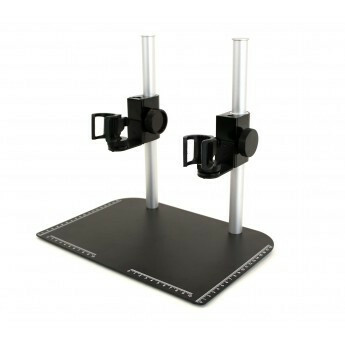 It is designed for use with 2 microscope cameras and features 2 vertical poles and 2 focus blocks with dual holster assemblies which can be pivoted close together or farther apart, as needed.The key benefit of this arrangement is simultaneous side-by-side on-screen comparison of 2 individual specimens, or viewing 1 object from different angles. The ability to compare and contrast an unknown specimen against a known control makes this an ideal tool for law enforcement officials, forensics specialists, crime scene investigators and research scientists.The vertical post allows 360-degree rotational positioning of the observed specimen and up to 10 inches of working distance, which can be very useful when dealing with over-sized specimens or working with tools during observation.The dual holsters offer up to 45 degrees of viewing off the vertical axis, and most importantly, they each secure to a focus block with a fine-focus mechanism for precise vertical positioning. This in turn results in sharp, vividly-detailed on-screen images for capture and documentation. Precision machine-crafted components ensure a lifetime of performance in a well balanced and stable ergonomic design. Wt. 4.4 Lbs; Size 12.5" x 8.75" x 11.75".NOTE: Microscopes sold separately.